L 14-19 cm (ad. with tail extension 3-5). Breeds on cliffs in mountain areas and along steep coasts, sometimes also in cavities on ruins, under bridges etc. Migrant, winters in tropical Africa. Builds a closed nest of mud with entrance tunnel, fixed to roof of cave, recess or similar site. Rare but regular vagrant to Britain & Ireland, mostly Mar- May and Aug-Nov. Often hunts insects high up in remote mountain districts. IDENTIFICATION: Resembles Barn Swallow, having similar size and shape with long, pointed tail-streamers, but immediately told by pale rump, which at distance can look white (cf. House Martin) but at close range is light rusty-red at top and somewhat paler (sometimes whitish) to rear. Close views also reveal that nape has a narrow rusty-brown band and that head-sides are pale, not blue-black. Wings and tail dark brownish-black (tail without Barn Swallow’s white ‘windows’), mantle, scapulars and crown shiny blue-black. Red-rumped Swallows in flight are also identifiable from below at distance by their pale throat and breast and squared-off black undertail-coverts (white on Barn Swallow). At close range, underparts are seen to be pale rusty-buff or buff-white with very discreet, thin streaks. Flight intermediate between Barn Swallow and House Martin, clipped wingbeats but also a lot of slow gliding on straight wings. - Juvenile: Shorter tail-streamers, less blue gloss above, buff-white tips to tertials and many wing-coverts. VOICE: Noisy, but not so loud as Barn Swallow. Call, often given by flocks hunting insects, a rather soft but spirited, nasal ‘tveyk’ (recalling Tree Sparrow in tone). 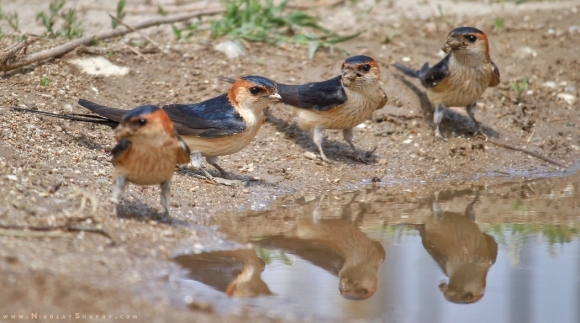 Alarm a sharp ‘kiir!’ Song allied to Barn Swallow’s in structure, contains croaking sounds and rattles, but the introductory twitter is much lower in pitch and harsher, slower and shorter (with rhythm and ring almost like song of Black-headed Bunting).